Do not put the Tin caddy in Oven, Microwave or dishwasher to avoid damage. Pull up tin lid when you open the tin caddy. Do not rotating tin lids in case the abrasion causes! ★There are two patterns (God of Longevity & "FU" Character of Hundred) on the tea caddy, which means longevity and good healthy. Pewter is one of the most valuable precious metals in common since thousand years ago until today. Fine pewter is an alloy of tin. It can be highly polished or buffed to a satin finish. Pewter, like other precious metals, has set standards that specify that pewter muscontain at least 92 % pure tin. But products of Oriental Pewter (Thailand) exceed the standard of 92% pure tin. Our products contain 97% pure tin, Antimony and copper 3% (Lead free) which absolutely safe to use. Our pewter is an alloy of tin, antimony and copper, tin being the main component at 97% Tin in its pure form, whilst being the fourth most precious metal in common use (after platinum, gold and silver ) today, is too soft for practical use. Copper and antimony are therefore added as hardening agents. Pewter is available in a variety of finishes all ideal for the production of giftware, being highly practical and durable whilst also being easily engraved. Tin is a plentiful natural resource and tin mining has little or no impact on the environment. Tin is bright and attractive and extremely versatile. How to care - To care for your Oriental pewter's pewter ware, please take care your pewter by do not knock or jostle or scratch on pewter ware with anything which can cause damage. We recommend you wash the article in warm water with a light solution of dishwashing soap and dry with a soft cloth. Please do not use abrasives or caustic detergents to polish your pewter ware. 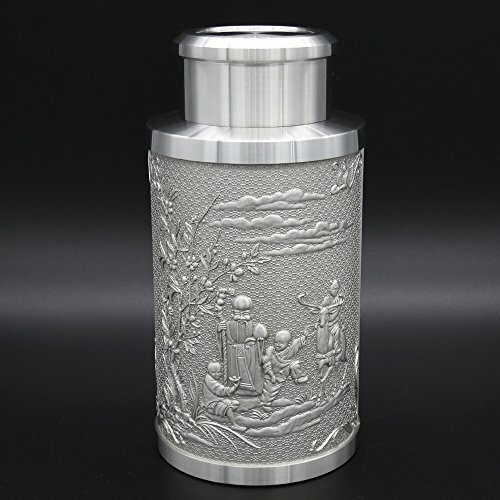 If you have any questions about this product by Oriental Pewter, contact us by completing and submitting the form below. If you are looking for a specif part number, please include it with your message.